The Butterfly Cluster lies in the direction of the galactic centre, at an approximate distance of 1,600 light years from Earth. Messier 6 was named the Butterfly Cluster by the American astronomer Robert Burnham, who described it as a “charming group whose arrangement suggests the outline of a butterfly with open wings.” The cluster has an apparent magnitude of 4.2. Its designation in the New General Catalogue is NGC 6405. Messier 6 is estimated to be around 100,000 million years old. 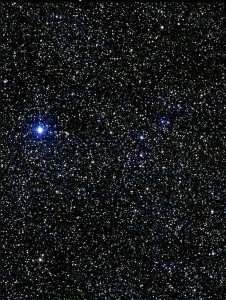 Most of the bright, visible stars in it are hot, young, blue stars belonging to the spectral class B4-B5. However, the brightest star in the cluster is an orange giant belonging to the spectral class K.
The star, BM Scorpii (HD 160371), is a semiregular variable, exhibiting variations in brightness ranging from magnitude 5.5 to magnitude 7. The stars in Messier 6 formed in the same molecular cloud between 51 and 95 years ago and are all moving together through space. They are loosely bound to each other by gravity. The cluster was discovered by the Italian astronomer Giovanni Battista Hodierna before 1654. 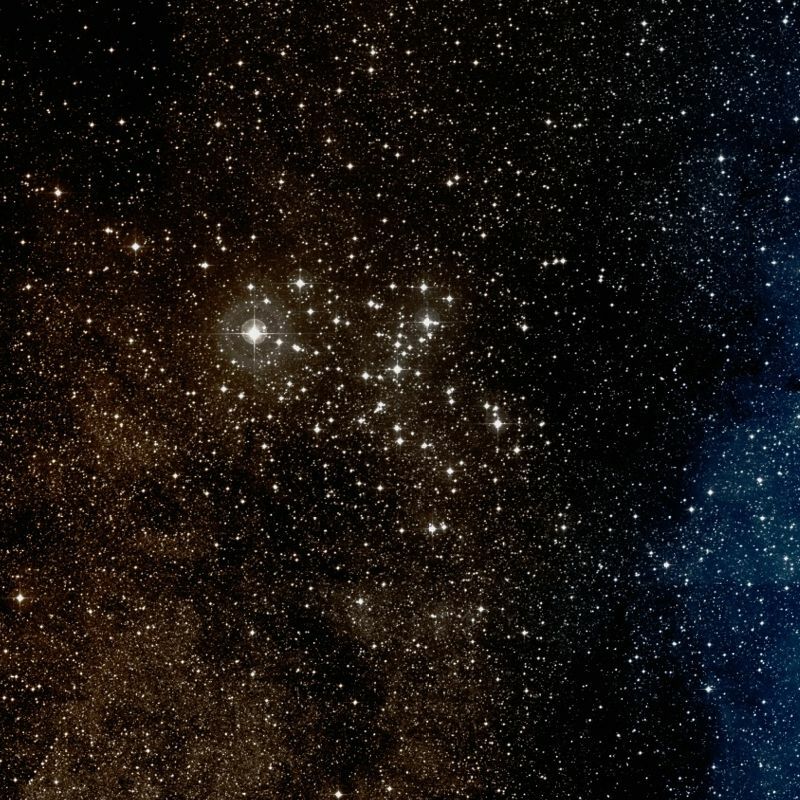 It may have been seen by the Greek astronomer Claudius Ptolemy in the 2nd century while he was observing the nearby Messier 7 (Ptolemy Cluster), which lies only five degrees southeast of M6. The Ptolemy Cluster is a significantly brighter and larger open cluster, and it lies much closer to Earth, at 980 light years. The distance, number of stars and other properties of M6 were not measured until the 20th century. In 1959, Swedish astronomer Ake Wallenquist identified around 80 stars in the cluster, all lying within a region of 54 arc minutes in diameter. The main portion of M6 has an angular diameter of 25 arc minutes, corresponding to about 12 light years in linear diameter. Messier 6 is best seen in binoculars. Its apparent size is roughly the same as that of the full Moon. 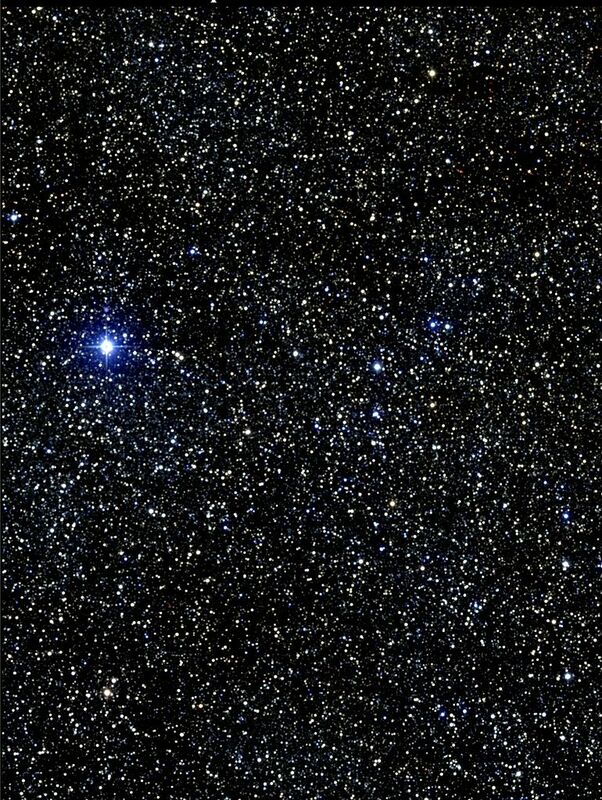 The cluster contains more than 300 stars. Binoculars reveal only a few dozen and a small telescope will show about 80 stars brighter than 11th magnitude. Butterfly Cluster (M6). Atlas Image mosaic obtained as part of the Two Micron All Sky Survey (2MASS), a joint project of the University of Massachusetts and the Infrared Processing and Analysis Center/California Institute of Technology, funded by the National Aeronautics and Space Administration and the National Science Foundation. The cluster lies in eastern Scorpius, 5 degrees north and 1.5 degrees east of the multiple star Shaula, or Lambda Scorpii. Shaula is the second brightest star in Scorpius, with a visual magnitude of 1.62, and it marks the scorpion’s tail. 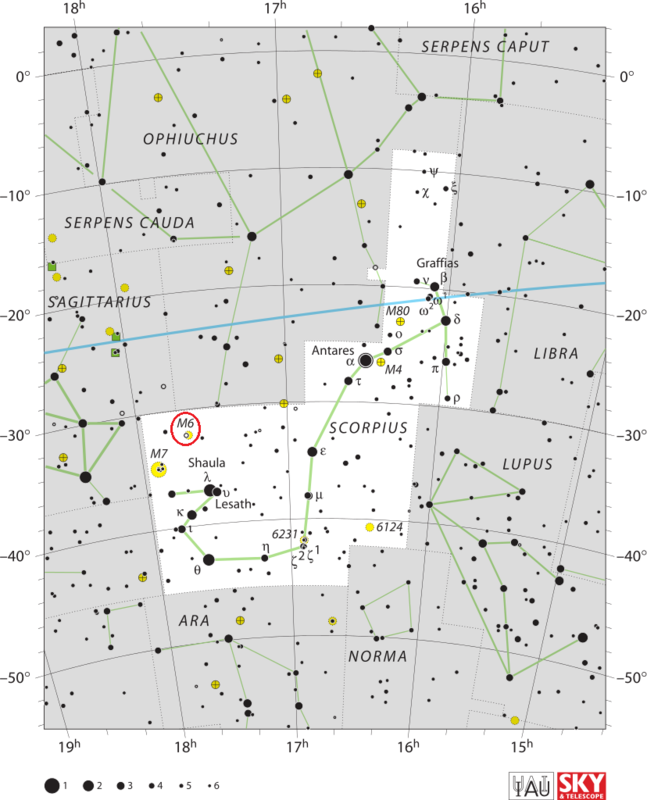 Shaula can be located by following the line of stars that curve from Antares in a southerly direction. Messier 6, Messier 7 and Shaula form a triangle that can be seen without binoculars to the right of the Teapot asterism in Sagittarius. 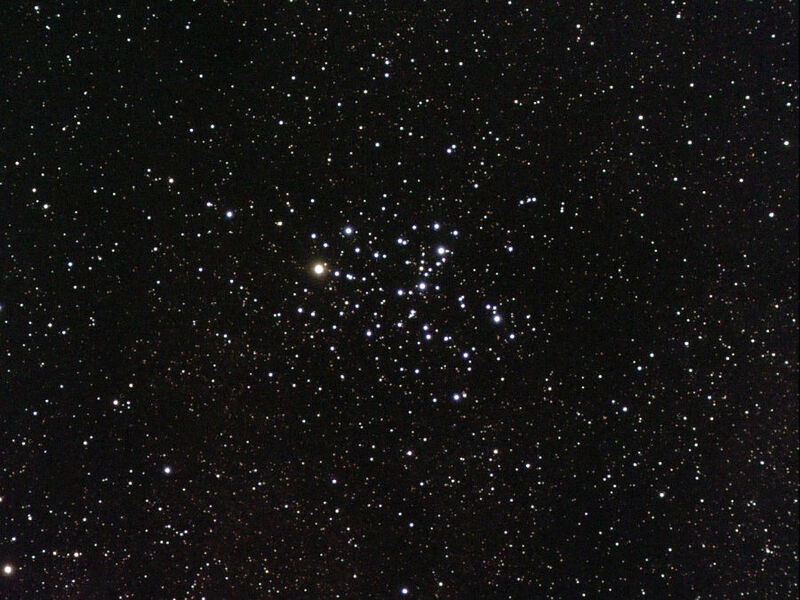 The Ptolemy Cluster (M7) is the southernmost Messier object in the sky and it lies a little farther to the southeast of M6, closer to the horizon, while the Butterfly Cluster is a bit higher in the sky. Messier 6 is easy to see without binoculars under good viewing conditions. The butterfly shape appears in 7×50 or 10×50 binoculars, and more stars appear in small telescopes. The contrast between the orange BM Scorpii and other member of the cluster is quite striking. The best time of year to observe the Butterfly Cluster is in the summer months, when Scorpius appears high in the sky for observers in southern latitudes and is visible above the horizon to observers in the northern hemisphere. M6 is much easier to observe from locations south of the equator because Scorpius never rises high in the sky for northern observers. Messier 6 lies at a closer angular distance to the galactic centre than any other Messier object. The galactic centre, the rotational centre of the Milky Way, lies in the direction of Sagittarius constellation, near the borders with the constellations Scorpius and Ophiuchus.